The Big Creek Nature Trail is open, except for the elevated boardwalk. 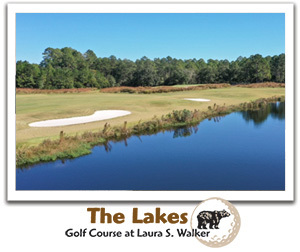 "Wander among the pines at Laura S. Walker, the first state park named for a woman, an oasis that shares many features with the unique Okefenokee Swamp, where you can enjoy the serene lake, play rounds on a championship golf course, and stroll along the trails and natural communities in this southeast Georgia haven." Located near the northern edge of the mysterious Okefenokee Swamp, this park is home to many fascinating creatures and plants, including alligators and carnivorous pitcher plants. Walking or biking along the lake’s edge and nature trail, visitors may spot the shy gopher tortoise, numerous oak varieties, saw palmettos, yellow shafted flickers, warblers, owls and great blue herons. The park’s lake offers opportunities for fishing, swimming and boating, and kayaks and bicycles are available for rent. The Lakes, a championship 18 hole golf course, features a clubhouse, golf pro and junior/senior rates. Greens are undulating rather than tiered. Each fairway and landing area is defined with gentle, links-style mounds that accent the course’s three large lakes. New Sportsman's Cabins sleep six. The park’s namesake was a Georgia writer, teacher, civic leader and naturalist who loved trees and worked for their preservation. Read the story of Laura Singleton Walker.